Spring at last! After being held hostage by snow and cold during the grueling winter, we craved warm sunshine. So on a recent 60+ degree day, we headed out to Pineland Farm in New Gloucester for a much needed respite. We drove onto Route 115 in Yarmouth and continued up Route 231 to New Gloucester. Although the trees are still leafless, the sky was a spectacular cloudless blue and the wind was dormant – just a gorgeous day to be outside. The approach to Pineland Farm in the direction we were heading is impressive. Rounding a corner, the road crests on a hill and then declines amid fields crisscrossed by white fences. A large red barn is on the right and Pineland’s Equine Center is on the left. 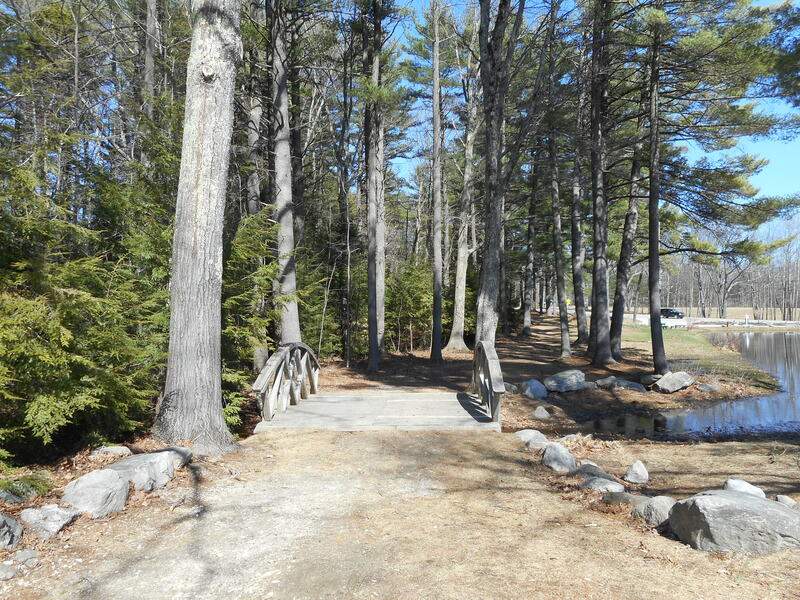 We continued straight on 231, past the main Pineland Campus to The Pond at Pineland on the left. There is a small parking lot by the pond and we parked there. benches on one side and stone benches on the other. What a beautiful setting to enjoy the bird song, warmth of the sun and fragrance of the spring air! 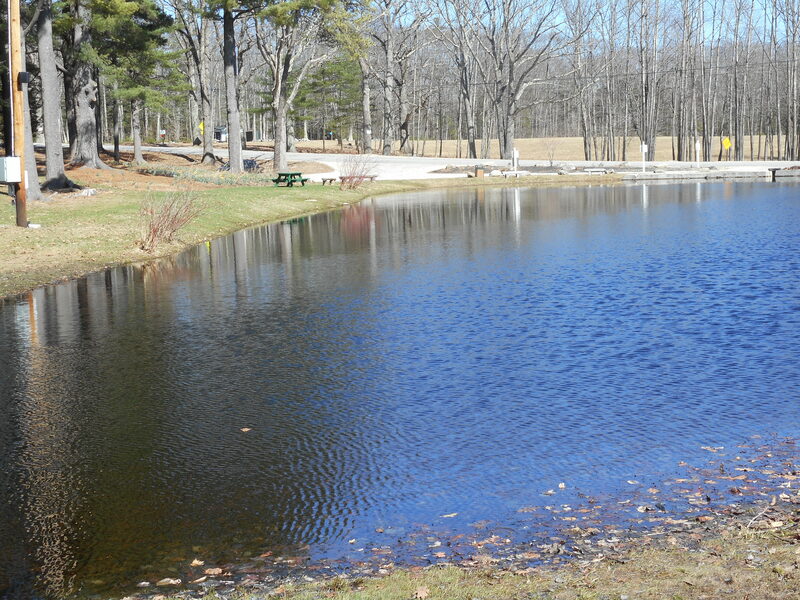 The ice was gone from the pond and minnows darted about. leads from the area of the pond to the campus. 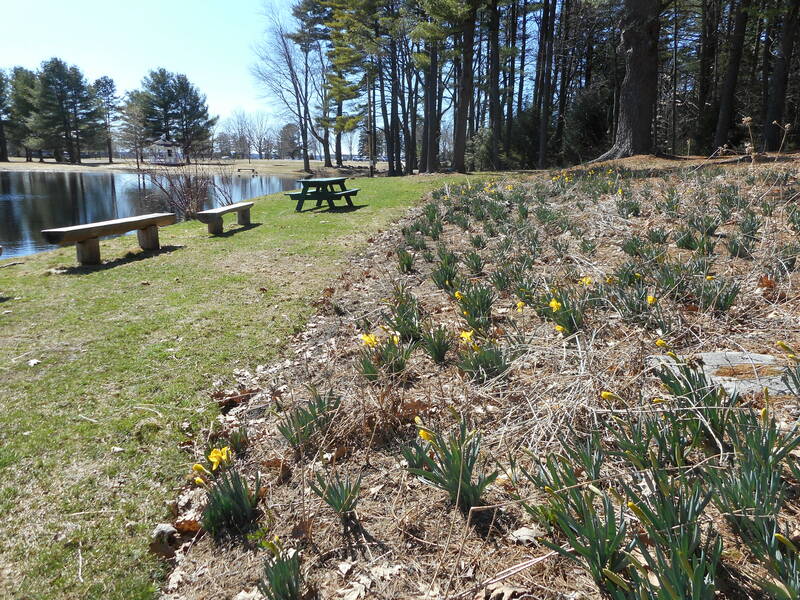 There is a patch of daffodils just coming into bloom beside the pond. A picnic table next to the pond invited us to sit and dine. 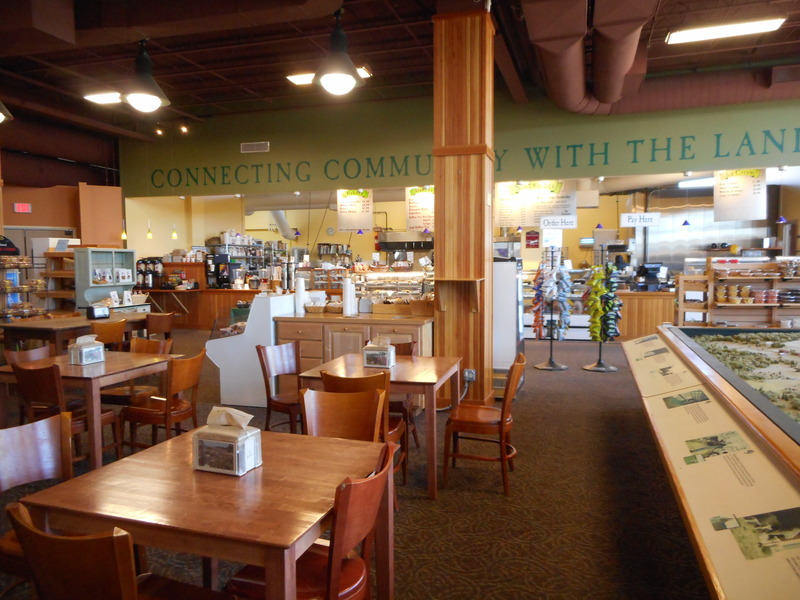 The Welcome Center at Pineland offers sandwiches, soups, salads and baked goodies. We made a visit there and chose a lunch to go and returned to the picnic table to dine in Nature’s ambience. 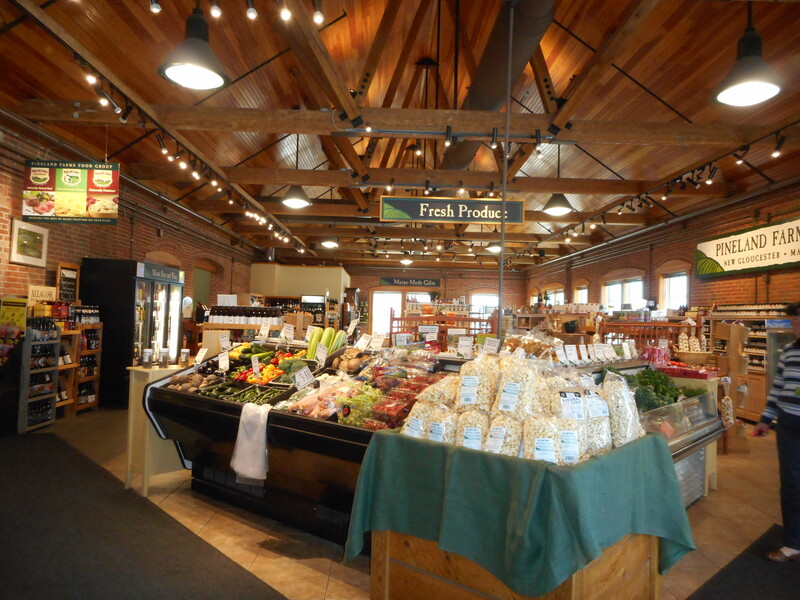 The Welcome Center also sells fresh produce, Pineland cheeses and meats, Maine made crafts, books and toys. There is a large, interactive display board of the entire Pineland Campus. A visit here is a pleasant way to shop and spend an afternoon. 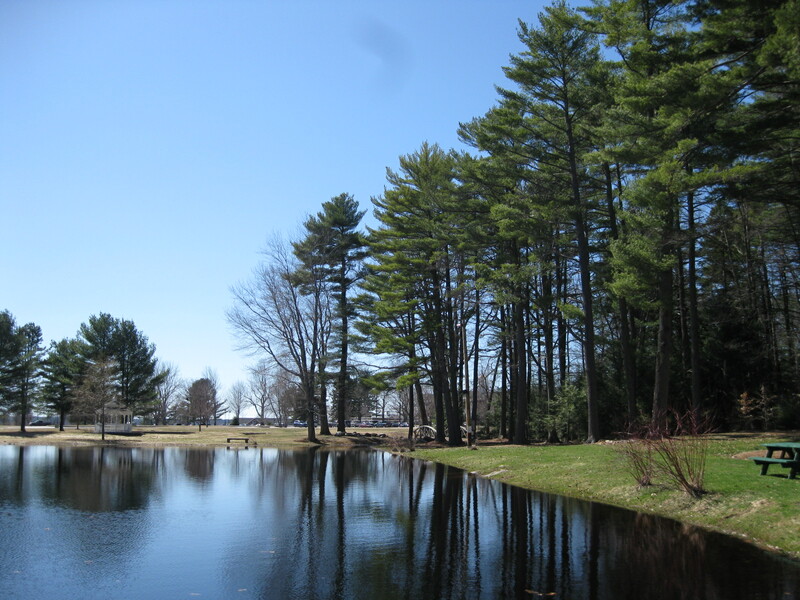 A few hours in the serene setting of the Pineland Pond was a splendid way to welcome Spring. In late spring and summer there is a beautiful garden across the road from the pond. We will return to Pineland in a couple of months to enjoy the garden and will post pictures. 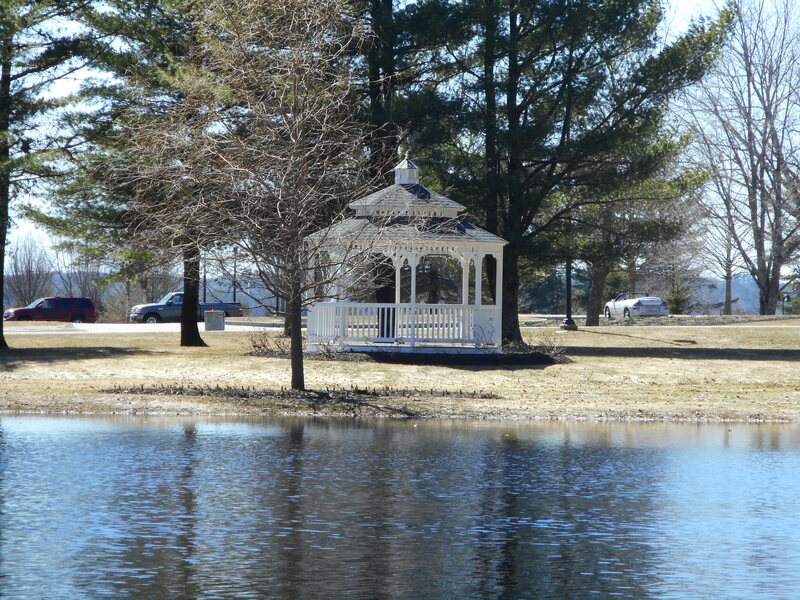 This entry was posted in Maine, Nature and tagged Daffodils, Gazebo, New Gloucester Maine, Pineland Farm, Ponds, The Pond at Pineland. Bookmark the permalink.